Helsinki Summit: Will the Great Powers Overcome the Crisis of Small Thinking? Presidents Putin and Trump will meet for the third time in Helsinki July 16 with expectations more spectacularly fluid than in either of the two earlier meetings. Both leaders clearly want the meeting and both clearly want something to come out of the meeting. Yet, neither side appears to know what that might be, and the cautious betting is that not much will. In the annals of US-Russian relations, the current interlude must be one of the more peculiar—more puzzling, more implausible. Everyone knows the relationship is as bad as any time since the worst moments in the late phase of the Cold War. The level of hostility each country’s political establishment feels toward the other is all out of proportion to the grievances they have against each other. Mutual mistrust has grown so thickly layered that policymakers and pundits have difficulty imagining a path forward, and no one quite understands how all this has come to pass. Hope, however, even in its present rather limp form, springs eternal. The two national leaders will meet for the third time in Helsinki July 16 with expectations more spectacularly fluid than in either of the two earlier meetings. Both leaders clearly want the meeting and both clearly want something to come out of the meeting. Yet, neither side appears to know what that might be, and the cautious betting is that not much will. At the same time in the smog of the moment there is the dim hope that the summit could be a breakthrough event, like the Trump-Kim summit in Singapore, and somehow one or the other president will make a dramatic move that would cut relations free from the current impasse. So, what might happen July 16? Each side appears to be hunting for a step that can be seen as a summit success. Reports suggest that President Putin is ready to press Iran to withdraw its forces from southwestern Syria close to the Israeli border as a way to give President Trump an achievement he can claim from the summit. The trouble is that the US objective is to get Iran out of Syria entirely, and that Russia neither can nor wishes to deliver. Trump is likely to dance gently around the issue of Russian election interference, if he raises it at all. And that will improve Putin’s mood. But what plausibly could be a more substantial outcome, if one or the other leader decided to rise above the crisis of small thinking that has plagued the relationship throughout the descent into Cold War? Conceivably Trump might propose a mutual commitment to renew the New START agreement when the time comes in 2021, something Putin would likely reciprocate. Or the two leaders could announce that they had instructed their negotiators to break the logjam over INF treaty violations by agreeing to inspection measures addressing each side’s concerns. 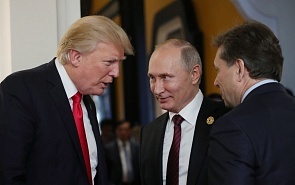 Or as a workaround for the crippling but frozen issue of Russian interference in US elections, the two might agree to begin a formal negotiation over the limits to political involvement in the other country’s domestic political life or to launch cyber negotiations, including uses directed at electoral and other critical infrastructure. There are other lesser measures the two might take that, without entailing radical change, would represent a positive step forward. One would be a commitment to seek a NATO-Russian agreement to regulate the conduct of air and sea patrols in the Baltic and North Atlantic regions. Or an agreement to restore some of the working groups under US-Russian Bilateral Presidential Commission. Given two critical realities, whatever the shades of uncertainty may be, the outcome of the Helsinki summit is likely to vindicate modest expectations. On the Russian side, the reluctance to make concessions on any of the major issues dividing the two countries (Ukraine, Syria, information warfare, election interference), because Russia insists that it is blameless, makes real progress impossible. On the US side, the deep skepticism within the Congress, the media, and even large parts of the administration over the possibility of cooperating with Russia ties Trump’s hands. And matters are not helped by the lack of clarity in what the administration hopes to accomplish in general with its Russia policy or even what that policy is. Perhaps the best to come from the July meeting, if the two presidents find some way to engage one another, will be an impulse to invigorate engagement at all levels of government. Overcoming the inertia of bad relations will not be easy. But unless the two governments re-engage, the chance of changing course is non-existent.